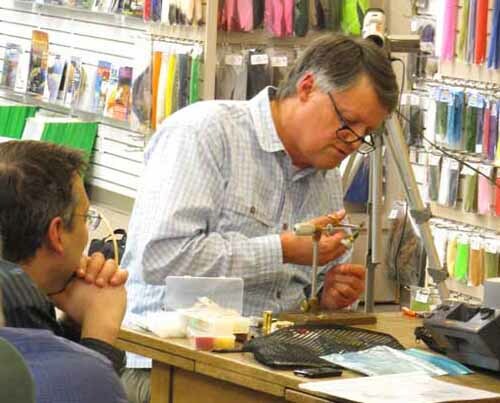 Skip's fly tying clinics normally run about 2 1/2 hours with a break of 10 minutes or so in the middle—the break is as much for the attendees as it is for Skip. Tying and Fishing Flies for Trout Lakes must run at least near its full length. But other tying clinics can be almost any length, shorter or even longer than usual. In this show Skip goes back and forth from projector to tying vise. For each lake insect we watch slides showing the insect, the water it lives in and hatches (if it hatches) from, a fly or two for its imitation, and how and when to fish that fly. Then the lights go up and Skip moves to the vise to tie the fly (or flies), pass a sample around, and answer a few questions. Then it's back to the slides, and so on. The attendees leave this show knowing how to tie a modest number of new, solid fly patterns; knowledge on how to fish them; and a handout with the pattern for each fly. About two-and-a-half hours long. Another slide-show-and-tying-demonstration combination. Skip explores the five major Western trout-stream mayflies (green drake, PMD, blue winged-olive, trico, March brown), shows them in slides, teaches you to identify each one, and also teaches you to understand the important aspects of their behavior and, consequently, how to fish their hatches effectively. After each insect is explored on the screen, the lights come up and Skip demonstrates the tying of effective imitations. About two-and-a-half hours long. at a local fly shop.